This chapter and its sections are normative, unless otherwise indicated. Note 1. 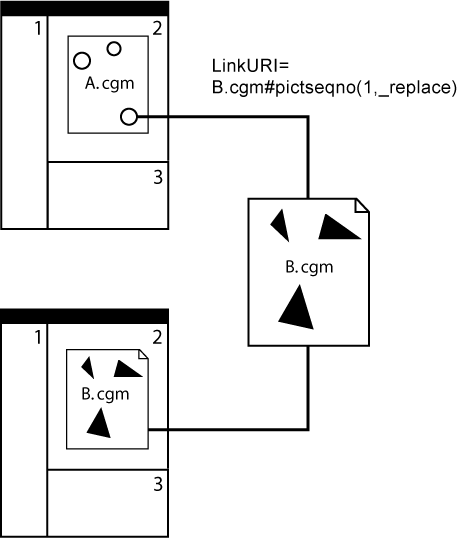 Multiple pictures per WebCGM instance were allowed in WebCGM 1.0. 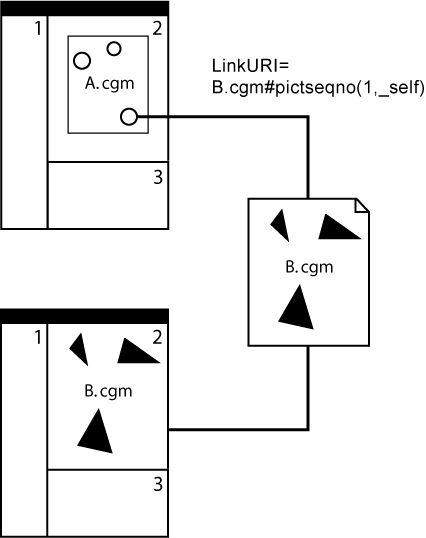 Since 2.0, WebCGM allows only one picture per metafile. For backward compatibility with existing 1.0 metafiles and with viewer implementations, the fragment syntax is unchanged with regard to the picterm. Secondly, the character repertoire for all of these productions is further restricted as defined in section 2.2 of XML 1.0, fifth edition. objid - corresponds to WebCGM Begin APS 'id' parameter; further restrictions: as the name construct defined in section 2.3 of XML 1.0, fifth edition. The above fragment EBNF defines a xcfterm production whose 'xcfurl' parameter identifies an XML Companion File associated the WebCGM identified by the IRI. WebCGM viewers that support XCF must interpret the fragment, locate and load the XCF. The 'xcfurl' parameter is itself a IRI, and it can be absolute or relative. WebCGM viewers shall resolve a relative 'xcfurl' IRI relative to the IRI of the WebCGM instance with which the resource file is a companion — i.e. relative to the WebCGM file referenced by the base part of the IRI containing the fragment — rather than relative to the file containing the IRI reference (e.g., an HTML file). The following subsections describe in detail how fragment parameters are used to specify the picture behaviors and object behaviors of links containing the parameters. An informative summary of the rules is provided in the last subsection of this section (3.1.2.8). WebCGM 2.1 & 2.0 viewers might receive requests for non-existent pictures in metafiles of any version, and there should be fallback behavior as there was in WebCGM 1.0. Note: This table comprised the entire normative rules of WebCGM 1.0 for "picture behaviors". However, it did not include sufficient generality in the possible resource types, nor in different presentation contexts. Therefore it is retained as examples of correct application of the current, more generalized rules of WebCGM. 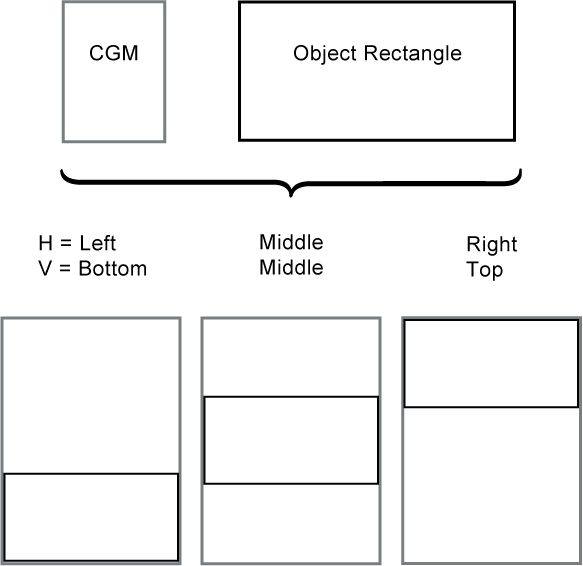 The following table enumerates the object behaviors available in WebCGM. The Navigation column indicates whether the viewer performs any navigation for the behavior, for the selected object(s). Highlighting indicates whether the viewer adjusts the highlighting of the selected object(s) in some way ("X") or not. See the 'visibility' APS Attribute for discussion of its effect on execution of Object Behaviors. The CGM:1999 standard allows the definition of an APS to be continued in pieces which are disjoint in the file. If an APS occurs which has the same value of the 'id' parameter as an earlier APS occurrence, then that is construed as a continuation of the definition of that object. Since version 2.0, continued APS constructs are prohibited in WebCGM metafile instances. Description. The application structure (APS) of type 'para' may be used to identify text ("paragraphs"). 'Para' together with 'content' can potentially enable applications to build text search functionality, especially in cases where the underlying graphical data does not comprise graphical text in a searchable form (e.g., the text has been rasterized, polygonized, or visually-single strings are fragmented into multiple smaller text elements). Except when occurring in Text Open State, 'para' APSs may contain any CGM graphical content allowed by this profile. Description. The application structure (APS) of type 'subpara', may be used to identify smaller fragments of text within APS of type 'para'. This enables, for example, the identification of the larger text block (the "paragraph") for searching purposes, and the tagging of smaller fragments as hotspots. Except when occurring in Text Open State (see 3.2.1.7), 'subpara' APSs may contain any CGM graphical content allowed by this profile. 'Subpara' APS may not contain any nested APS.The APS attribute content rules of sub-para matches those of 'para'. Viewer Behavior. Unlike other application structures, 'grnode' is not interactive; i.e., it does not receive mouse events. If a mouse event is triggered on the geometry of a 'grnode', an ancestor node of type 'grobject' may respond to the event. Therefore, the content of a 'grnode' could effectively appear to be interactive, for example, if the 'grnode' were a direct child of a 'grobject'. See the Event interface for more information regarding mouse events. APS of type 'grnode' also do not support most DOM functionality such as Style Properties, object-extent inquiry, etc. See the appropriate sections of the DOM chapter for details. The rules of CGM:1999 (corrected) allow an APS to occur in Text Open State, i.e., after a 'notfinal' RESTRICTED TEXT (RT) element but before the terminating 'final' APPEND TEXT (AT) element. This allows, for example, a substring comprising one of the interior APPEND TEXT elements in a RT-AT-AT-...-AT sequence to be contained within an APS. Thus, for example, the APPEND TEXT element (substring) could be the target of a link, or could be the source of a link (a "hotspot"). Such an APS is referred to as a substring APS. WebCGM 2.1 restricts the APS types of such substring APS to: 'grobject', 'para', and 'subpara'. For APS of these types that are not substring APS, the content rules are as quoted in sections 3.2.1.1, 3.2.1.3, and 3.2.1.4 respectively. If an APS of one of these types is a substring APS, then its content is restricted as follows by the rules of CGM:1999 (corrected): only the APPEND TEXT element and those text attributes normally allowable in Text Open State (under CGM:1999 rules). The allowable APS Attributes for 'grobject', 'para', and 'subpara' are as designated in 3.2.1.1, 3.2.1.3, and 3.2.1.4 respectively, regardless of whether or not they are substring APS. The WebCGM DOM (Chapter 5) allows the application of geometric transforms to APS of all types except 'grnode'. Therefore, a geometric transform could potentially be targetted at an APS ('grobject', 'para', or 'subpara') that contains a substring APS. 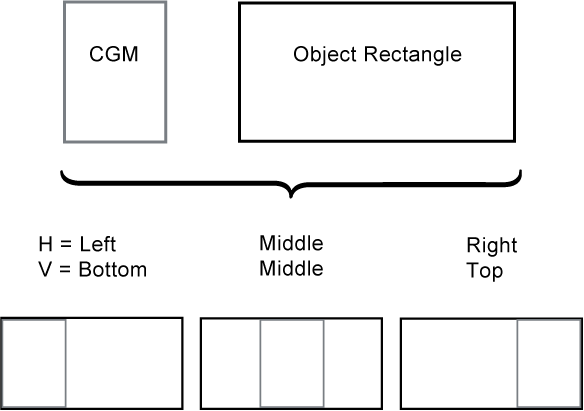 In this case, the layout and rendering rules of CGM:1999 for Restricted Text and Append Text (see ISO/IEC 8632:1999, section 6.7.3) shall have precedence. Any attempt to set a geometric transform on a substring APS shall have no effect. Viewer behavior. A non-visible object is not displayed. For the purposes of this section, a non-visible object is one whose 'visibility' attribute value is 'off', or one whose 'visibility' attribute value is 'inherit' with a non-visible parent. Highlight requests are ignored for non-visible objects, regardless of the source of the request (i.e., whether from Object Behavior keyword, or from highlight() DOM method, or from interaction feedback such as mouse-over). Visibility does not affect the ability to navigate to an object, for example by Object Behavior keywords. A non-visible object behaves like a non-interactive object (i.e., it cannot be clicked or highlighted). This does not imply that the 'interactivity' APS attribute is changed to off, but simply that the user agent must not respond to mouse events. Viewer behavior. When the 'interactivity' of an object is set to off, events for this object are disabled. This has the effect of disabling event handlers, cursor changes, highlighting, screentip and hyperlinking for the given node and its descendants. Regardless of the value of its 'interactivity' attribute, an object that is the target of a link responds to highlighting requests (keywords), provided that its visibility is enabled according to the value the 'visibility' APS Attribute. The object element can contain optional param elements, which allow the HTML to pass additional data to the target object. The following param elements are defined and permitted for WebCGM. Each param is presented as a name followed by permissible values (after the ":"), and description. The names and the permissible values are case-insensitive, with the single exception of the value of the 'onload' param (which identifies the event handler script function that is to be invoked upon the onload event, represented below as"<eventHandlerName(evt)>". The background param element is deprecated and may be removed in a future version of this profile. The viewport param element is obsolete as of version 2.1 of this profile.